Toshiba is set to launch its first gaming laptop, the Satellite P105-S921, along with several other new Satellites notebooks. The Toshiba P105-S921 will be the “deluxe” model of the Satellite P105 line that will have two other less tricked-out configurations. Besides the GeForce Go 7900 GS, the high-end system will also take on an Intel Core Duo T2400(1.83Ghz) CPU and 1GB of RAM. Sporting a 17-inch TruBrite screen and tipping the scales at 7.2 lbs, it’s clearly a desktop-replacement system. Like the Toshiba Qosmio G35-AV600, the P105-S921 will also employ a Dual Mode Touchpad, embedding slick-looking illuminated icons within the touchpad itself. 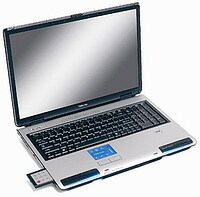 The big laptop also features a massive 160GB hard drive and a DVI-D output port. You can expect the P105-S921 to retail for $1,999. Also the mag reports that Toshiba plans to update several of its mainstream units, the Satellite M105 and A105 series, with Intel Core Duo processors. This entry was posted on Thursday, April 6th, 2006 at 9:30 am	and is filed under Laptops. You can follow any responses to this entry through the RSS 2.0 feed. You can leave a response, or trackback from your own site.